Orafol / Reflexite Americas has recently come out with a high intensity prismatic type 4 tape known as their 5900 series. It has an acrylic topcoat and uses air backed prismatic technology for brighter, more vivid colors. It has an outdoor rating of 10 years. We carry 6 colors in this material. Yellow, White, Red, Blue, Green and Orange. High intensity prismatic or HIP type 4 is approximately 45 percent brighter than standard glass bead high intensity type 3 tape. These two products are similar in appearance, however, the prismatic version is both brighter and more vivid. The image below shows a comparison of the two. 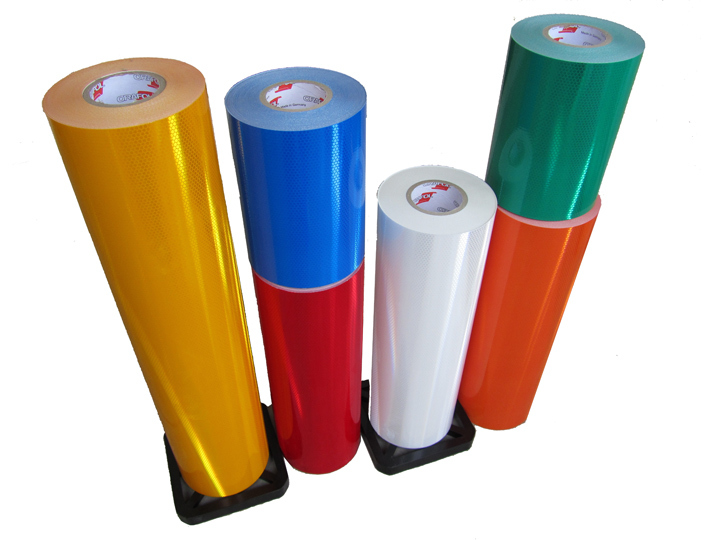 The high intensity prismatic tapes can be used for signage and any other application where vehicles, equipment or objects need to be seen day and night. For more information on this product click here.